This means that to a very high probability, much higher than a random association, certain quasars are physically associated with lower redshift galaxies. The quasars are found in pairs or higher multiples of 2. The results further imply that these quasar redshifts indicate a real ejection velocity component and a large intrinsic non-velocity or non-cosmological redshift component. 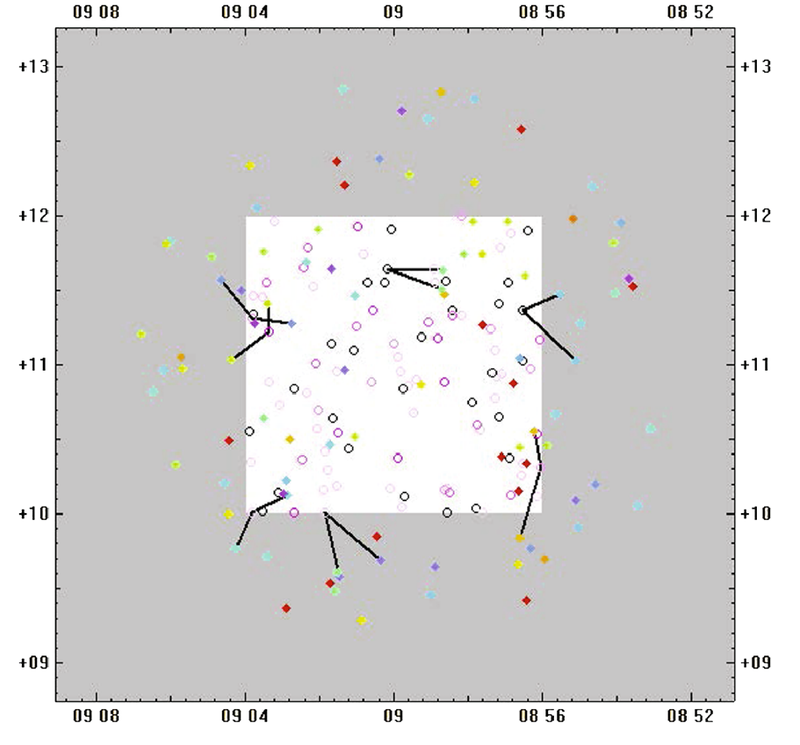 …, certain SDSS quasars are physically associated with lower redshift SDSS galaxies and separately with lower redshift 2MRS galaxies; at least some quasars of very different redshift are physically associated with the same nearby galaxy; with the available typed galaxy data, quasar families occur with approximately equal frequency around nearby ellipticals and lenticulars versus around nearby spirals and irregulars, and quasar families occur somewhat more frequently around nearby unbarred spirals than around nearby barred spirals. When analyzed separately, the bright and faint quasars maintain high and comparable detection significance around both nearby and distant galaxies, suggesting that gravitational lensing is an unlikely physical explanation for the signal that we detect. A quasar excess exists at Karlsson redshifts around the 2dF, SDSS, and 2MRS galaxies. What does all this mean for biblical creation? Number one, it is strongly critical of the big bang hypothesis that all stars and galaxies result from the early big bang universe. This describes a scenario of quasars being ejected from active parent galaxies in a hierarchical process. If quasars are associated with parent galaxies, which have much smaller redshifts than the associated quasars then that changes the whole story of the alleged evolution of the universe. Many quasars are more local than at enormous cosmological distances. That is, their large redshifts do not indicate a measure of distance. Again this brings the standard big bang cosmology into conflict. How do you explain this from a big bang perspective? From a biblical creation perspective, it is straightforward: God created the galaxies on Day 4 of Creation Week using this hierarchical process, where quasars are ejected from the active hearts of their parents. And we are observing, now, the results of that process. Your headline is slightly misleading. You could declare “confirmed” if the results were replicated independently, and no other hypothesis better fitted the data. Until then, “suggested” is more accurate. Can the ejection model accommodate the wide variation in measured QSO redshifts from 0.1 to 7? If z was intrinsic, wouldn’t you expect more consistency, and/or there to be some relation with the redshift of the parent galaxy? Are the proper motions of quasars consistent with the ejection model? With projected ejection distances averaging around 200kpc, how does this fit with Biblical timescales? That is without invoking unknown inflationary, so to speak, mechanisms that let them begin their journeys exceeding the speed of light? The context of the word “confirmed” in the title of this post is that the conclusion of Paper 1 (Fulton & Arp, 2012) is confirmed, when different galaxy and quasar surveys were used. Also different galaxy types, and magnitudes and higher redshifts for galaxies were used. The latter is a response to the criticism that at higher redshifts the peaks in any histogram of redshift data is not seen, thus refuting the idea that quasars have intrinsic discrete redshifts. That was in response to earlier smaller handpicked surveys where quasars were found to have redshifts very close to Karlsson’s characteristic redshifts. Here we show (as in Paper 1) if you identify the putative parent galaxy and transform the quasar redshift into the rest frame of the galaxy, allow for a small fraction of the speed of light for ejection of the quasars (in pairs), that the identified quasars do indeed have intrinsic redshifts at Karlsson numbers, and this effect is much higher than random probability would assign. Yes, as explained above and in referenced material, the ejection model does explain/allow for the quasar redshifts between 0.1 and 7. I have answered your second question above, and in the paper if you care to read it. Yes, proper motions (ejection speeds) of the identified associated quasars are consistent with expectations. //With projected ejection distances averaging around 200 kpc, how does this fit with Biblical timescales? // The distances of ejected quasars depends on several factors. The distance to the parent galaxy is one, which is not the alleged distance to the quasar (with high redshift) in a big bang universe. But how do you fit any structures greater than 2 kpc (~6600 light-years) into the Biblical timescale? It depends on the model you apply to explain light-travel time in the universe, as well as structure formation. So the answer is, yes it does. Several of those models assume some form of mature creation. However this may not be necessary, if some time dilation, relative to Earth time, was in effect during the Creation Week. So unknown solutions are needed to make the model work? What about light travel times within our own galaxy that exceed 6ky? The first point is that the evidence suggests an association between some galaxies and quasars. That would have to be explained by any cosmology, whether creationist or not. And it is not something that many in the big bang community even like to consider. That fact is evidenced by the fact that it took (Fulton & Arp, 2012) Paper 1 five years to get through review to be published in ApJ and this newest paper took an equal length of time, but finally was published in Ap&SS. So yes a creationist needs an unknown solution, and I only suggested a time dilation scenario, as a possibility. But so does big bang cosmology need unknown solutions (inflation, dark energy, dark matter, etc) to make it work. If you would care to read the articles on this site, I have addressed the alleged 6000 light-year issue, since Creation. So you concede that Big Bang cosmology is not alone in having serious problems needing exotic solutions? I already read your articles on the light travel time issue. If there are conclusions to be drawn, I seem to have missed them. Would you agree that *all* YEC cosmologies are in need of some exotic solution or another? What price Occam’s Razor if only so many assumptions and so much unforeseeable mathematics will make them fit the data? We hardly even need to look upwards for an unending list of phenomena that make no sense unless the universe is ancient: radiometric timescales, ocean floor magnetic banding, gradations of ocean sediment thickness, volcanic island chains, ice core records, dendrochronology, stalactite formation, to name only a few! You do appreciate the sheer volume of science in multiple disciplines that would be totally wrong in a young universe? No, I do not concede creationist cosmologies have serious problems requiring exotic solutions. I concede they are works in progress. But their basis is that the biblical timescale is correct. You probably have not read the multitudes of YEC publications addressing the timescales of the many phenomena you cite. Age is not inherent in the measured data; it is an interpretation imposed upon it. Once an ancient universe was accepted the rest followed. It is all interpreted in light of it indicating long ages and deep time.